What Is Green Memory Foam? When those of us who are older were growing up, to label something as “green” meant (1) its color, (2) it was unripe, uncured, or undeveloped, (3) of a person, by extension from #2, naïve or inexperienced, a novice, or (4) it was associated with a person, firm, or place with the name Green. Times have changed. Now when a product, such as a memory foam mattress, is called “green” it is perceived or billed as environmentally friendly. Many people assume a “green” product is made of substances that are natural, organic, or both. However, this is not always true. Some materials, such as rayon, are made of natural ingredients, such as cellulose from woody plants, but the process of producing them may not be entirely green. Here the degree of “greenness” is relative to the production process used. It has become fashionable for manufacturers to promote their products as being green, or at least greener than their competitors. 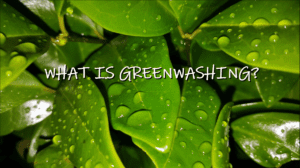 When claims cannot be substantiated, then the practice is labeled greenwashing. This has become common in marketing memory foam mattresses and memory foam pillows, as well as other products containing foam. The three kinds of foam most in question are latex foam, polyurethane foam, and memory foam. The most naturally green bedding foam is latex foam (foam rubber) if it is all-natural latex foam made only from liquid latex drawn from rubber trees. However, all-natural latex is not as durable as synthetic latex, and it is more expensive to produce, so most “natural” latex is a blend with synthetic latex, a petroleum product, therefore it is not as green. The Global Organic Latex Standard (GOLS) does classify latex as “organic” if 95% of the latex used is from rubber trees certified as organic. Unfortunately, there is no universal standard for when, by the proportion of botanical and synthetic sources, blended latex is “natural” and when it is not. However, even synthetic latex is greener than polyurethane foam. Polyurethane foam is made by linking together molecules of polyols, which are made from oils. Then they are mixed with extremely toxic isocyanates. ideally, all the isocyanates should be converted, therefore neutralized, in the finished product. These oils are refined for the most part from petroleum. The “green” issue for many is the use of petroleum. Most petroleum derivatives are toxic, even though the end product isn’t. Also, the extraction of oil from the ground is not a green process. The process of producing polyurethane foam is not always perfect, so there is some initial emission of gases from oils in new foam. As polyurethane foam ages, it begins to break down. The residue is more a nuisance, while the gases may be toxic or irritating. Firmer foam lasts longer. Polyurethane foam has been further modified into other kinds of foam, such as memory foam, latex-like foams, hybrid foams (having properties of both latex and memory foam), and memory foam substitutes (which could be called “metamemory foam”). Memory foam has become the most common bedding foam in use. Developed from NASA cushioning material, it was first used in mattresses in 1991. Basically, it is a kind of polyurethane foam, but with added ingredients to make it more heat sensitive. This causes it to conform to the shape and weight of a person sitting or lying on it. It does not very quickly bounce back (like latex foam), but “remembers” the shape for several seconds. This is the memory for which it is named. It is also called visco-elastic foam, or just visco. Memory foam has a more lingering and more unpleasant odor than polyurethane foam. This smell comes from more out-gassing, coming from the chemicals added to give the foam its memory. These include easily evaporating hydrocarbons known as Volatile Organic Compounds (VOCs). Some are toxic and/or irritants. Foam manufacturers have been revising the composition and manufacturing process of memory foam, trying to reduce VOCs to where they are negligible. By 2013, some manufacturers, but not all, had reduced these dramatically. The newer processes cost more, at least initially, so the newer memory foam costs a bit more. One of these newer memory foams is Biogreen. According to a March 2013 article in Space Daily, Relief-Mart, owner of Selectabed, was using a new memory foam in the Eros Mattress, a high-end model of their Tempflow brand. Almost two years before this, in July 2011, the editor of LA Splash wrote that Biogreen was being used in four Tempflow models, Gaia, Eros, Copia, and Selene. It is now standard in all models. Biogreen®, is not made mostly of plant-derived oils, as some people suppose. In 2013, memory foam could have no more than 10% plant-derived polyols without negatively affecting its performance and durability. Customers’ memory foam mattress reviews of models with higher percentages of plant oils showed early breakdown of the foam – sagging, loss of support, etc. What makes memory foam green? What the name Biogreen refers to is how this foam affects the environment of the room. First, it does not have certain chemicals in it, such as the ones used for flame retardants. It has no PBDE, TDI, Boric Acid or Bromine. Secondly, the foaming process was adjusted to prevent VOCs from forming. Biogreen was tested in an Air Quality Services lab (AQS is a division of UL) which tests materials for certification by OEKO-TEX, CertiPUR-US, and GreenGuard. The Biogreen Memory Foam was kept in a closed chamber for seven days (168 hours). The amount of emissions in the air at the end of that time was measured. It was found to have only 00.039 mg/m³ of VOCs. This is ¹/₁₃ the amount allowed by CertiPUR-US and only ⅕ of GreenGuard Gold, the strictest standard. Thus it appears that Biogreen is setting a standard (being an example) for others to follow. Public demand can be a great motivator. Having a proven product creates a demand for more of the same. Here are two examples of an industrial response to public demand. Magniflex memory foam mattresses are not made in the U.S.A. but in Italy. According to their descriptions, they use water instead of solvents in the foaming process. Reviews by customers say there were no odors. Amerisleep (a part of One Mall Group) boasts of its American-made memory foam. It is made by FXI (formerly Foamex, a spin-off from Firestone) using soy oil polyols produced by Cargill, the agribusiness giant. Cargill itself makes claims of superior support and durability for foams using its soy oil. However, this writer has not yet seen certifiable third-party lab test results, such as those by AQS. One Mall Group also has several affiliated bed review websites, which now disclose their relationship to OMG. Biogreen is in every Tempflow mattress. Also, the shredded memory foam used in the top-rated memory foam pillows by Snuggle-Pedic has Biogreen in the mix. In 2013, Relief-Mart was involved in a controversy over emissions claims. The only reason this is mentioned here now is that some people still bring up the FTC actions of 5½ years ago in comments, leaving the impression that this is a current issue. It is not. The issue has been resolved. Even though VOC emissions could be considered practically zero (see the lab test summary), the FTC said they had to be non-detectable to be cited as zero. 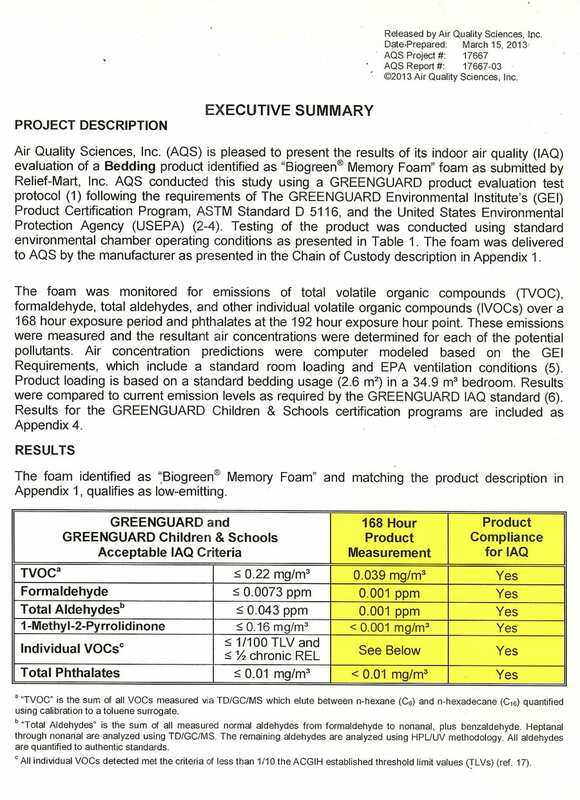 Therefore, the marketing department revised their claims to reveal the actual test result for VOCs, which is what they do today. As of now, this is still the lowest certified level of VOC emissions from memory foam. 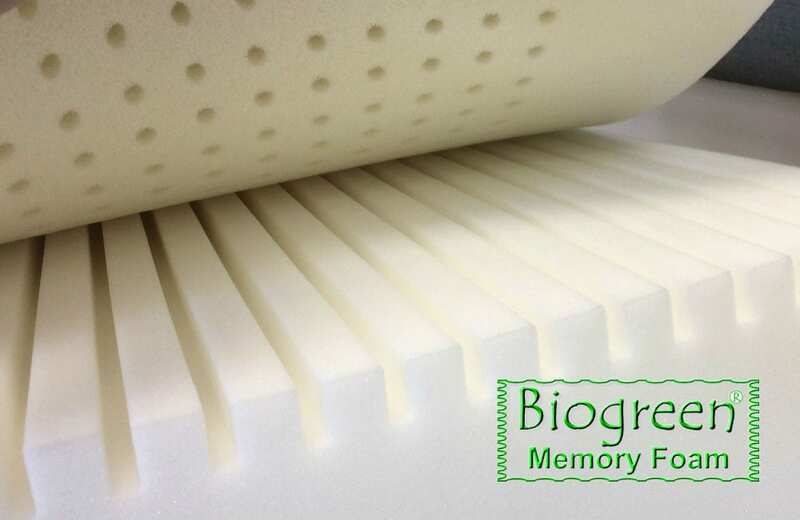 If you are looking for green memory foam, as far as we know, Biogreen is still the greenest.